The RF360 is Qualcomm’s front end solution to address the complexities manufacturers face when developing hardware for the world market. LTE frequency bands are all over the place, from one country to the next. That keeps manufacturers on their toes when working on their latest and greatest. Even Apple’s iPhone 5 has three different versions to accommodate the 40 different LTE bands around the world. 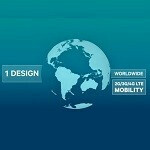 Qualcomm Technologies, the business unit that developed this handy design, claims to have broken through the fragmentation and has a single system level solution which can provide connectivity on 2G, 3G, and 4G across all standards, FDD-LTE, TDD-LTE, WCDMA, EV-DO, CDMA, TD-CDMA, GSM, EDGE. The front end solution obviously means that there will be more space available for manufactures to push the thinness envelope even further, plus this solution will be combined with Qualcomm Snapdragon chip-sets. There are a number of technical components that make the solution possible, and the details are in the press-release below, but they are nicely summarized in the video below. The best part is that we will not be waiting long to see this technology make an appearance in our smartphones, the RF360 will launch in the second half of this year. Given Qualcomm’s propensity for a licensed business model, we can expect this technology proliferate quickly. Except for the historical information contained herein, this news release contains forward-looking statements that are subject to risks and uncertainties, including Qualcomm Technologies’ ability to successfully design and have manufactured significant quantities of Qualcomm RF360 Front End components on a timely and profitable basis, the extent and speed to which the Qualcomm RF360 Front End components are deployed, change in economic conditions of the various ecosystems that Qualcomm Technologies’ serves, as well as the other risks detailed from time to time in Qualcomm Incorporated’s SEC reports, including the report on Form 10-K for the year ended September 25, 2012, and most recent Form 10-Q. Qualcomm Incorporated and Qualcomm Technologies undertakes no obligation to update, or continue to provide information with respect to, any forward-looking statement or risk factor, whether as a result of new information, future events or otherwise. I guess it's safe to say that it will be included with SD800. This is the biggest mobile news of the day by far and everyone is still more interested in SGS4 rumors instead.